I find it hard to believe today that I almost said a no to a Benarasi saree for my wedding. In those days, almost everyone wore a Benarasi for their wedding reception. No, not me, I had said digging my heels in. I wanted to be different. A Benarasi saree shopping excursion was, however, reluctantly planned. I went. I saw. I dropped jaw. I was sold. And I bought. The salesman in the shop who had immediately sensed my aloofness took it very personally. He started showing me sarees, unfurling each drape around me with flourish. Like a fisherman who casts his net in the hope of a good catch. Have a look sister, he had said. Brocade. Jamdani. Tishu (Tissue). Tanchoi. Jangla. Jangla? But wait, where’s the Benarasi? My first serious saree lesson happened at that shop. Benarasi is a generic name for sarees from Benaras. Duh! Brocade, Jamdani, Tissue, Tanchoi, Jangla and others, I was informed, are the names of sarees made in Benaras. Each type defined by the quality and weight of the silk yarn, the gold yarn and the overall design of the saree. 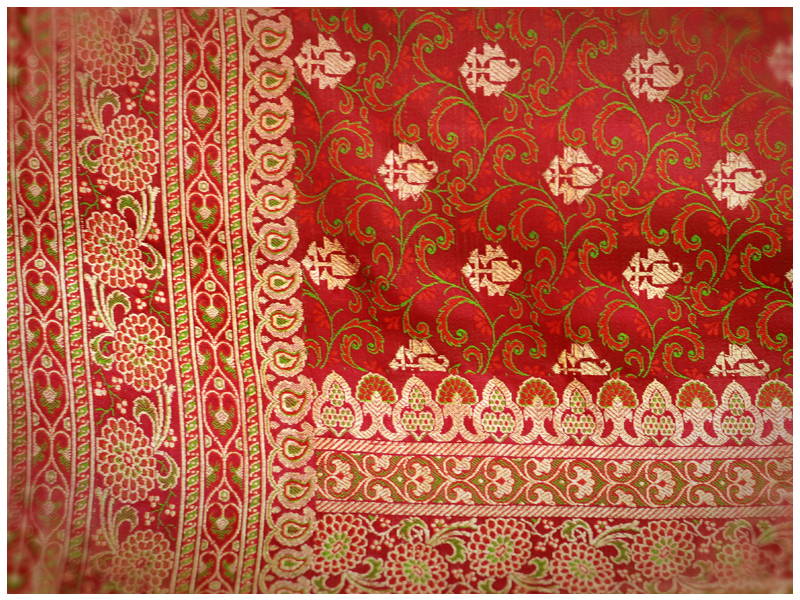 What I was looking for was the heavy, festive and celebratory Benarasi silk brocade. Technically, therefore, the title of this post should be ‘B for Benarasi Brocade’. After pulling myself out of the barrage of sarees and information about them, I surrendered to a ‘gulabi’ Benarasi brocade. And no babes, couture jargon was not around then. Pink was called ‘gulabi’ and not fuchsia. And that’s how I got my first and only Benarasi brocade. 23 years on, it is still the most resplendent garment in my wardrobe. 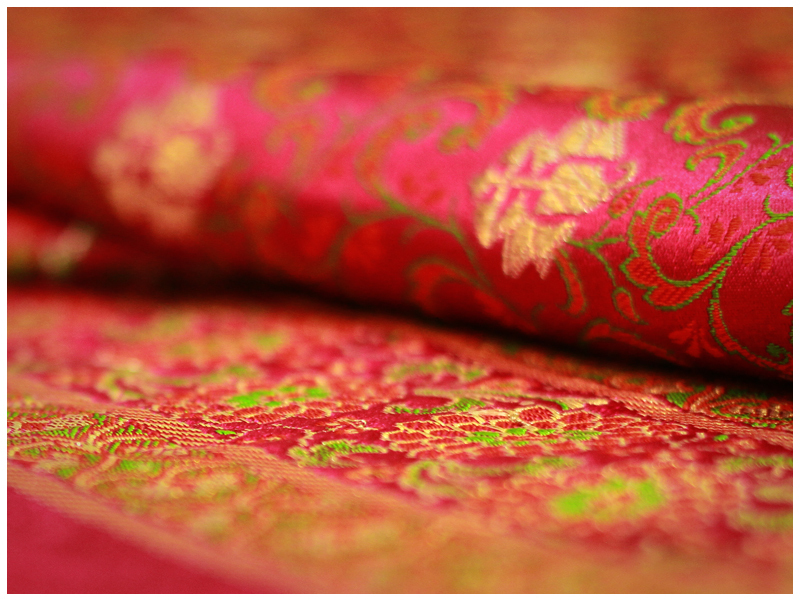 A Benarasi brocade is made using Mulberry silk that gives it a characteristic satiny look and lustre. Mulberry silk is the one of the finest, most expensive silks, made from the leaves of the Mulberry tree. 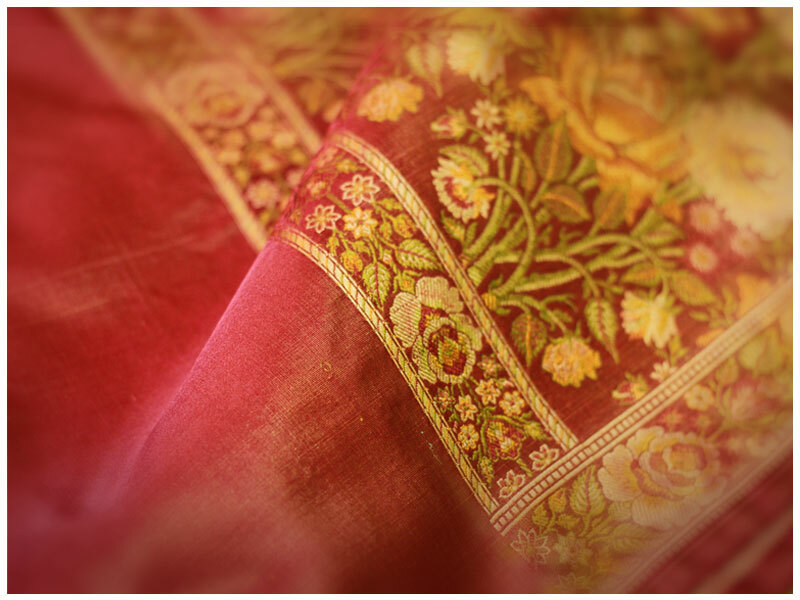 Other than China, India is one of the largest producers of this silk with most of it cultivated in Bangalore. It is thus called Bangalore silk. In Uttar Pradesh, this silk is called ‘Kataan’. Although the term ‘Kataan’ is now synonymous with Benares silk, and a quick Google search will confirm this, I have some different dots to join here. To me ‘Kataan’ sounds too much like a corruption of the word ‘Cotton’. Besides this, the word ‘katiyaan’ – to weave – is the verb of the noun ‘Kataan’. My unstudied hunch therefore is that ‘Katan’ simply means yarn. Not that it takes anything away from the protagonist of this story, but it is interesting isn’t it? 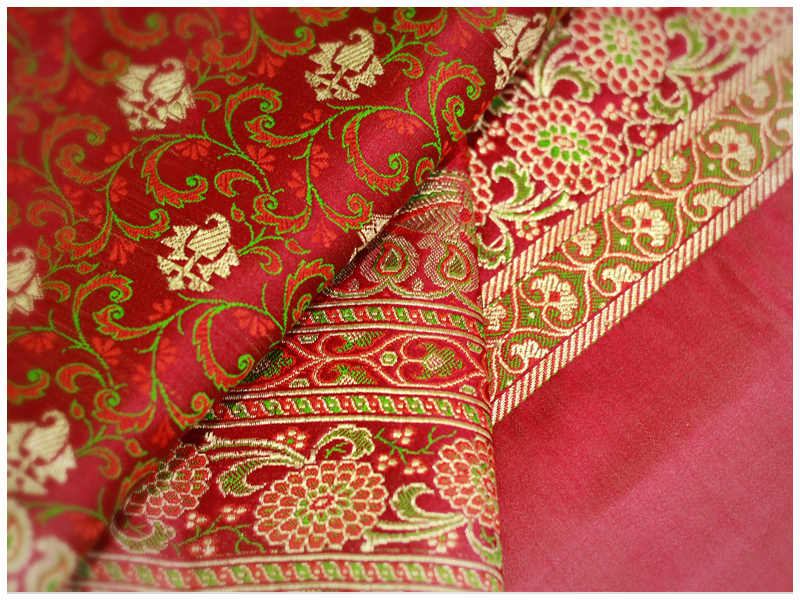 Brocades made from Mulberry Silk are usually expensive costing tens of thousands of rupees. Those made from China silk are less expensive, but just as beautiful. One way to check for Mulberry Silk is to crush it in your fist to see if it creases. Mulberry silk, or any pure silk fibre for that matter, does not crease easily and quickly. Today, brocades are ubiquitous, and it is difficult to say whether they are hand-woven or machine-made. But the Benrasi brocade, has something distinctive about it. Apart from the use of high quality silk, Benarasi brocades seldom deviate from the use of traditional motifs like ‘keri’, rose, star or the ‘minatashi’ – a star-shaped floret. Even a contemporary designs use traditional motifs very in a clever way. A thriving, well-organized weaver community in Benares creates and markets a host of different sarees within India and out of it. The community has well-defined hierarchies based on weavers’ skills and experience. There is significant degree of standardization and recording of tacit and process knowledge of weaving. Traditional motifs, border patterns, color combinations coexist with innovative, modern motifs to cater to a younger generation. The innovation has resulted in newer colours, fabrics that are easy to manage, less expensive; without letting go of the distinctive Benarasi touch. One of the most interesting things I learned about the weaver community in Benares is the involvement of designers in early stages of the weaving process. Designers may be experienced master weavers or professionals employed in cooperatives that manage the weaving units. Sometimes design is outsourced from well-known designers. A good Benarasi brocade hence reflects design thought. Even though opulent, the sarees reflect a high degree of aesthetics in their choice of colours, the consistency of motifs on the border and the body of the saree. Then there is the gold thread used in the weave, which adds glamour without making the saree gaudy. And it does not end with the looks of the saree. I never cease to be amazed at how easily this thick and heavy saree drapes. It practically drapes itself around you. That’s probably because of the way the elements are used to ensure their weight is well distributed through-out the saree. While writing this post, I came across an interesting document – a research paper actually – filled with amazing facts about sarees, Benarasi sarees, the weaver community and how they work, the thriving export and markets this saree has created in the West. If this post has piqued your curiosity, I strongly recommend you read this paper. Of the many interesting things this paper has to share, here is something that fascinated me the most. The heavily gilded Benarasi brocade, is one of India’s oldest examples of unmatched art. It finds a mention in Vedic scriptures and Ramayana. Silk was considered pure and hence used for worship. Since Benares was at that time, India’s religious capital, there was probably a huge demand for silk which resulted in large number of silk weaving units set up around it. 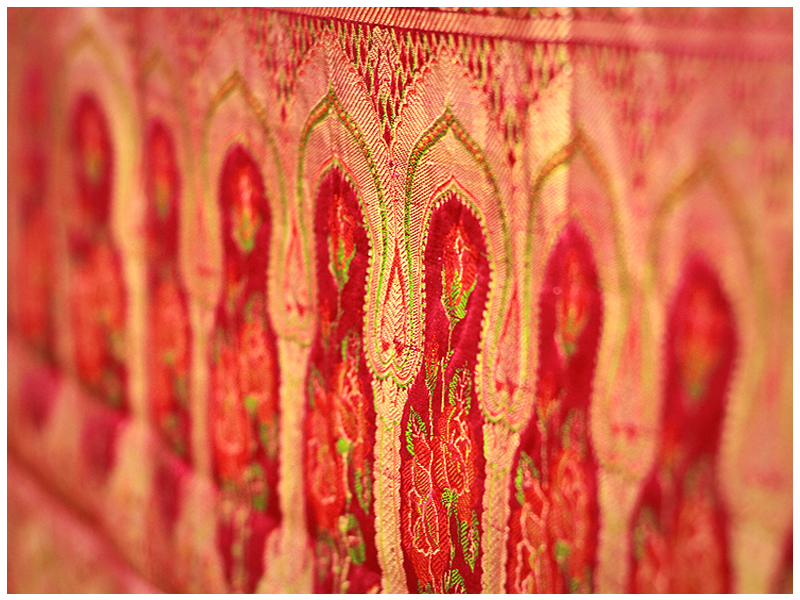 When the Mughals arrived in India, they added their own aesthetics to the design of the brocade and what we see today is really a memorable confluence of Hindu and Mughal aesthetics. To summarize the beauty of the Benarasi saree, I quote a piece of information from the same document. The Benarasi brocade is also called ‘Kinkhwab’ – ‘kin’ means gold and ‘khwab’ means dream – a ‘golden dream’. I agree. The saree saga continues next week with the alphabet B ruling the space. Can you guess the next saree with a B? Photographs: Creative courtesy of Akshay Pathare and his team – Anjory, Girish @ Corner Pixel. Photograph copyrights rest with Punam Medh. Wow! Enjoyed reading your piece. Looking forward to more. Just great Punam! enjoyed reading all the 3 blogs and am looking forward to all that follows from now on!